BIRTH OF JOHN THE BAPTIST: 3 PUZZLING QUESTIONS! Today, Sunday, June 24th is the Solemnity of the Nativity of John the Baptist. Q1. Were Mary and her unborn baby, Jesus, present at the birth of John the Baptist? Q2. Why does the Church celebrate John’s birth on June 24th rather than June 25th (the latter date would be exactly 6 months before the Lord’s birth on Dec. 25th)? Q3. John’s father Zechariah was unable to speak, but could he hear? Finally, it has long been believed that it was Mary who told Luke about all the events occurring in the first two chapters of Luke (directly or indirectly as the source). A2. In the fifth century A.D. the Feast of Christmas was established on December 25th, (exactly nine months, to the day, after the March 25th feast of the Annunciation). 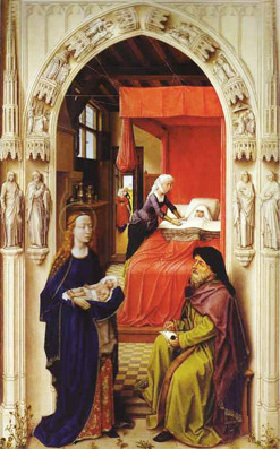 Gabriel told Mary that Elizabeth was in her sixth month of pregnancy. So 3 months after March 25th brings us to June 25th. But according to Francis Weiser, S.J., we celebrate on the 24th because of “…the Roman way of counting, which proceeded backward from the calends (first day) of the succeeding month. Christmas was ‘the eighth day before the Kalends of January’ (Octavo Kalendas Januarii). Consequently, Saint John’s nativity was put on the ‘eighth day before the Kalends of July.’ However, since June has only thirty days, in our way of counting the feast falls on June 24”. * Q1. a.) Jerome Biblical Commentary b.) A New Catholic Commentary on Holy Scripture. Also, the IVP Bible Background Commentary, New Testament and Halley’s Bible Handbook, New Revised Ed. Zondervan, 1965. Newland: The Year and Our Children, P.J. Kenedy & Sons, NY, 1956. Q2. Fr. Weiser, S.J., Handbook of Christian Feasts and Customs, Harcourt, Brace & Co., NY, 1958. Q3. Fillion: The Life of Christ, Herder Book Co., St. Louis, 1940.